Denali National Park and Preserve is a special place. The park is 6 million acres yet only has 92 miles of road. The park is home moose, Dall sheep, caribou, grizzly bears, wolves and some much more. The real highlight of the park is the mountain. 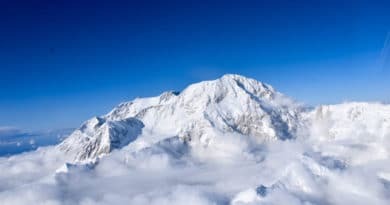 Denali is both the name of the park and the name of the tallest mountain in North America. Every year, 600,000 people visit this park. Most will spend 8 hours or so on a bus trip in the park. 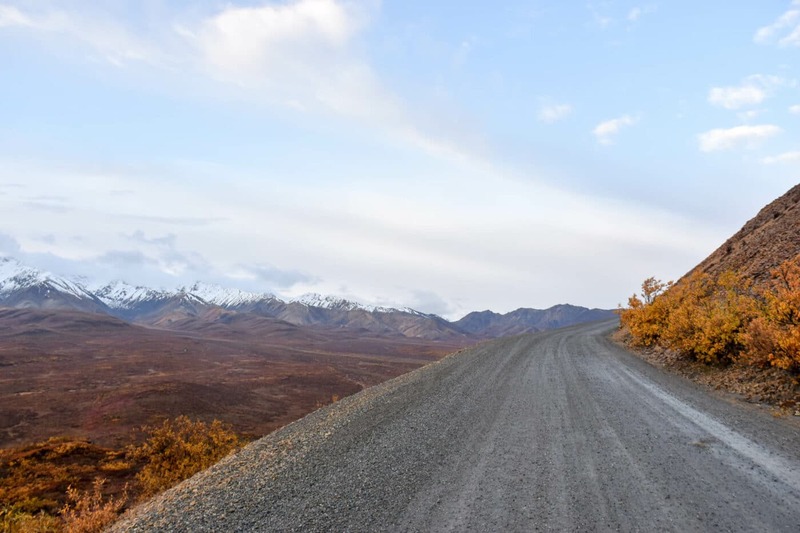 In September, a special group of visitors are given the chance to drive the Denali Park Road in their own vehicle thru the Denali Road Lottery. 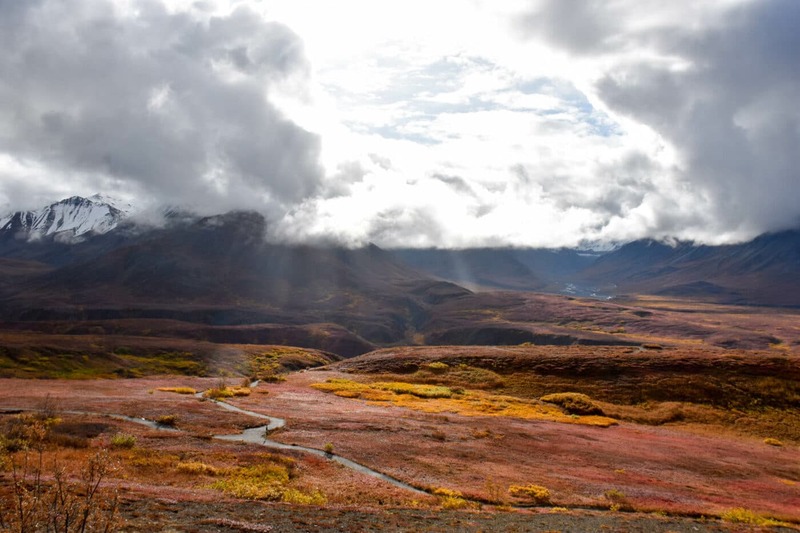 The Denali Road Lottery is a special 5-day event in Denali National Park. It allows park visitors to drive their own vehicles out the 92-mile park road to Kantishna (permitting weather and road conditions). These five days are the only time personal vehicles are allowed to drive past Savage River (Mile 15). The rest of the summer park visitors need to take a tour bus, shuttle, bicycle or foot to explore the park road. Road Lottery Permit Winners are allowed to bring any road legal vehicle under 22 ft into the park. Winners can bring as many people as the car can legally fit (1 seatbelt per person). The road lottery typically takes place on the second Thursday after Labor Day. 400 permits are issued a day with 1,600 permits for the general public and 400 permits to the U.S Military. The Lottery is open for applications between May 1 and May 30. You apply by going to www.recreation.gov. When you enter, you will give your preference which two days you would prefer a permit for. It costs $15 to enter and this is non-refundable even if you don’t get a permit. If you win the permit, you will be charge $25 for the permit. Your preference does not affect your chances of winning. They draw 1,600 names. The first person drawn gets their first choice day. The second person gets their first choice. If your name is drawn and your first choice is gone, they will give you your second choice. If both your preferences are gone, you will be assigned a day at random. If you are selected for a permit, you will receive an email. The winners are announced in mid-June (usually the weekend of June 15). At that time, you will be charged an additional $25 for the permit. Those aren’t the greatest of odds. Now there is a way to increase your odds of winning. You need more entries. You cannot enter yourself more than once and permits can’t be sold. But you can have other people enter and if they win have them transferable the permit to you. Also, have anyone planning to drive the road with you enter. This is what I did to get my permit in 2018. I had my mom, my dad and a friend enter the lottery. This gave me 4 entries in total. My mom got the permit and came with me for the drive. I was hoping for multiple permits so I had everyone put in a different first and second choice for their permit. Day 2 is always the military day so I am not eligible for those permits. This means I spend $85 to get my lottery permit this year ($60 in entries and $25 for the permit). I had a 34% chance of getting a single permit. I calculated this by the following formula. I did a bunch of math to figure out how many entries you need to increase your odds of winning. The hard part is that the total number of entries isn’t known until after the lottery. So its a gamble. Have your friends enter for you and reimburse them the cost (or invite them along in your car). Based on my calculation, I would aim for 8 entries a year. This means that you will have a good chance given the average odds is 1 in 7 and cost $145. If you are really lucky, you might even get two or more permits. I would use my entry table above and have staggared the days in hopes to get multiple permits on different days. What to do if you have multiple permits for the same day? On the off chance, you get multiple permits for the same day, head over to Anchorage Craiglist. There is a healthy number of people looking to trade permits for different days. Keep in mind, per the rules of the permit, you are not allowed to sell the permit and people to troll craigslist and report people who are sell permits. But feel free to give your permit to someone if you can’t use it. You can start picking up your permit the week before the lottery during the visitor centers regular business hours (9 a.m – 5 p.m.). On the second Thursday after Labor Day, the visitor center will be open until 7 p.m. each day during the lottery to allow for permit pick-up. When you pick-up your permit, they will ask how many people will be riding in your car. There is a $10 entrance fee per person which is good for 7 days. If you have an American the Beautiful pass, the fee is waived. I highly recommend getting the permit the night before your lottery day. 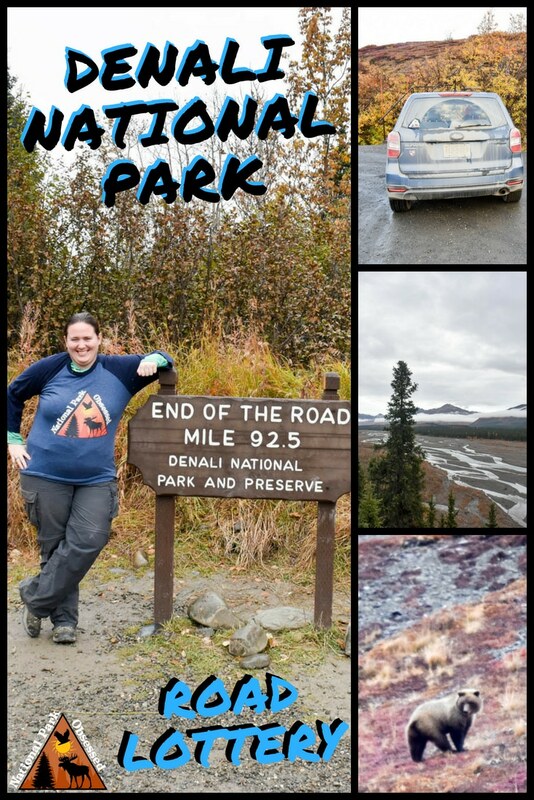 This will allow you to get an early start and make the most of your 18 hours to drive the Denali Park Road. 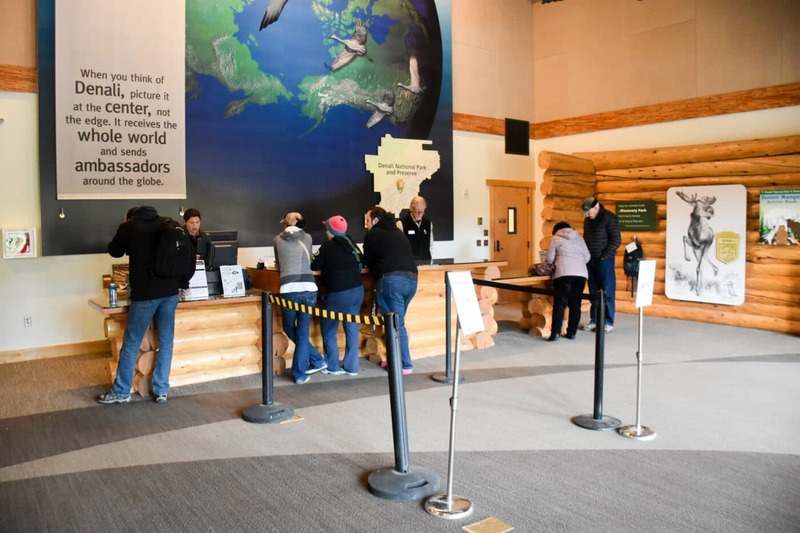 The Savage River Station (Mile 15) opens at 6 a.m.
– One entry per person – they do check based on names and billing address. There is no age limit so kids can win permits. 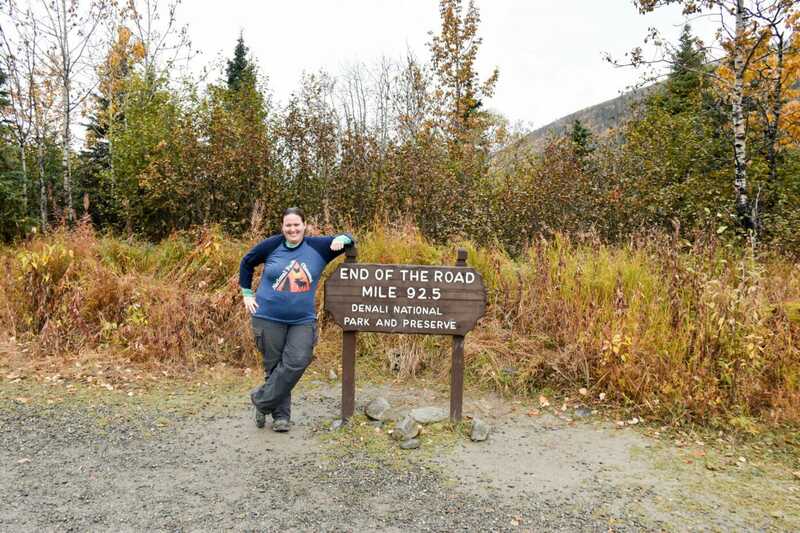 Travis from One Mile at a Time’s infant won a Denali Road lottery permit. – Those selected for a Road Lottery permit will be charged the $25 fee automatically. 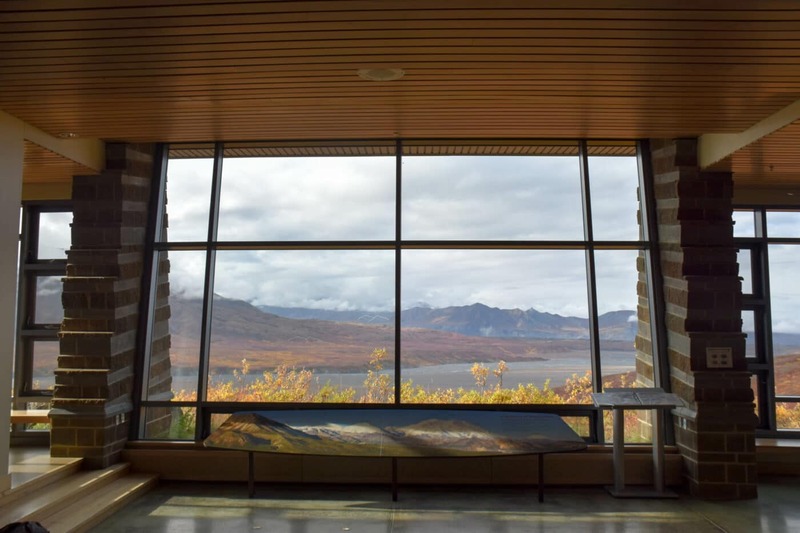 The park entrance fee is payable at the Denali Visitor Center when you pick up the permit. Interagency Federal Land passes will cover the park entrance fee. Please bring your pass with you along with photo identification. – The person who picks up the permit must be the person who was selected (must provide photo ID) or have the selected winner’s written approval. 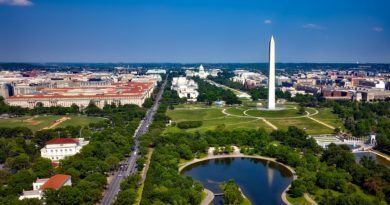 – Permits may NOT be re-sold. However, permits may be transferred. First, print the reservation confirmation email. The reservation-holder should write a short letter stating the original winner’s name, the date for which they were selected for a permit and the name of the person to whom the permit is transferred. – Only vehicles with Road Lottery permits will be allowed to drive beyond the Savage River Check Station at mile 15 of the park road. – There is not an established group size limit for Road Lottery. However, every passenger in the vehicle must wear a seatbelt. 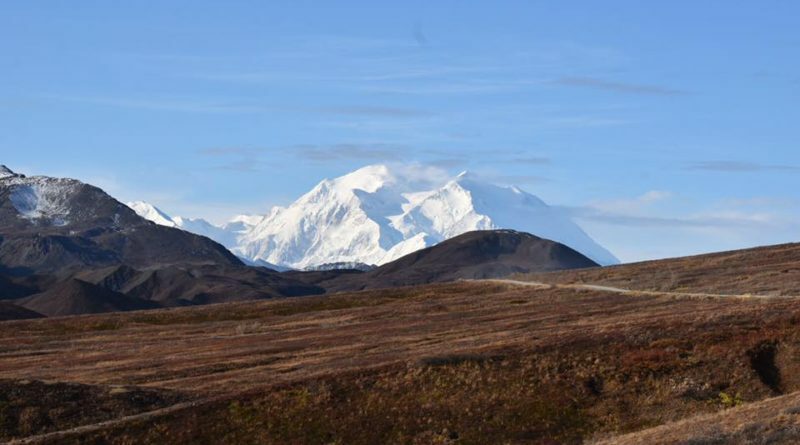 – The Denali Park Road speed limit is generally 35 miles per hour and 25 miles per hour around the campgrounds. At a minimum, it will take 5.5 hours to drive to the 92 miles to Kantishna. This number assumes no stops or slowdown on the way. – For those with a Road Lottery permit, the park road beyond mile 15 is open from 6:00 am to 12:00 am. 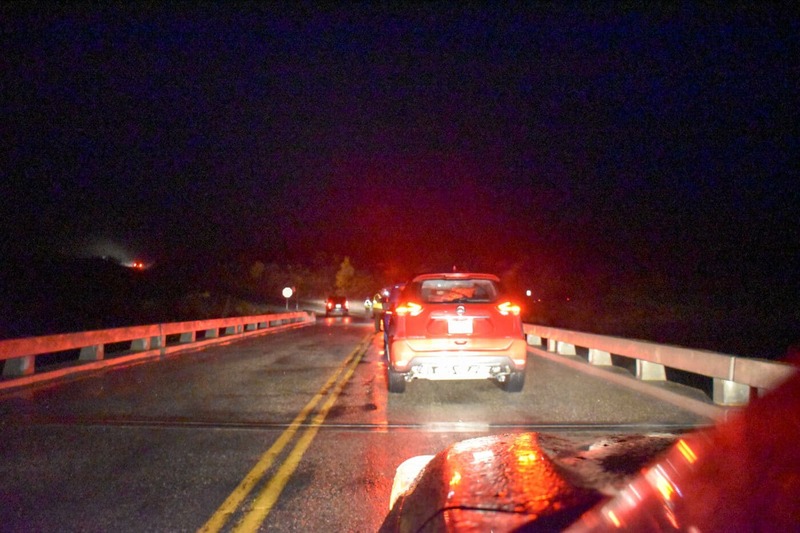 Areas further west on the park road will close prior to midnight. You must be past Wonder Lake heading towards the park entrance by 7:30 pm. – Road Lottery winners are not guaranteed a campground site in the park. – Don’t Move Firewood: Help protect our forests! Prevent the spread of tree-killing pests by obtaining firewood at or near your destination and burning it on-site. Moving firewood is illegal in some states. Visit dontmovefirewood.org to learn more. – If possible, leave your pets at home. Pets are only allowed on the Park Road and must be on a leash less than 6 feet. If your dog is barking, they must be secured in a vehicle with the windows rolled up. – When you stop to view scenery or wildlife, pull over to a safe location and do not obstruct traffic. Be aware that shoulders are often soft. – To view wildlife, stay on the road at your vehicle. Leaving your vehicle to view wildlife may cause animals to move away and spoil other visitors opportunities to see them. – If any animal changes its behavior due to your presence, you are too close. 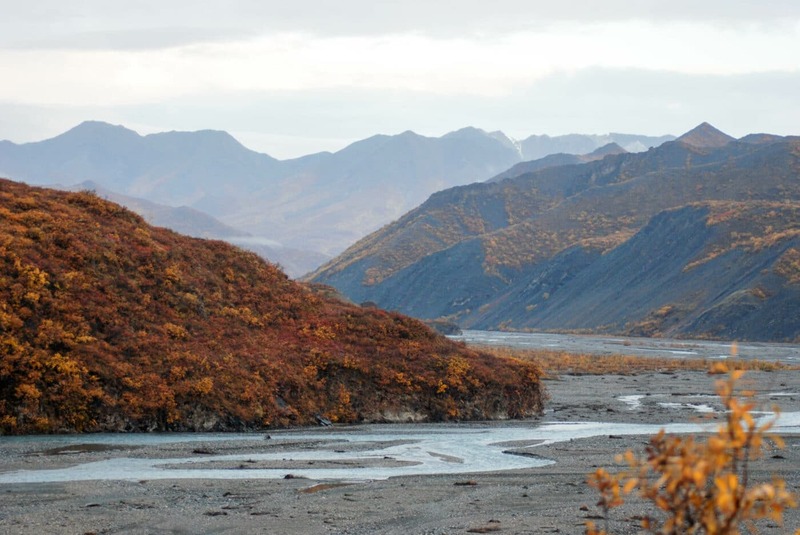 Denali National Park has 6 campgrounds in total. 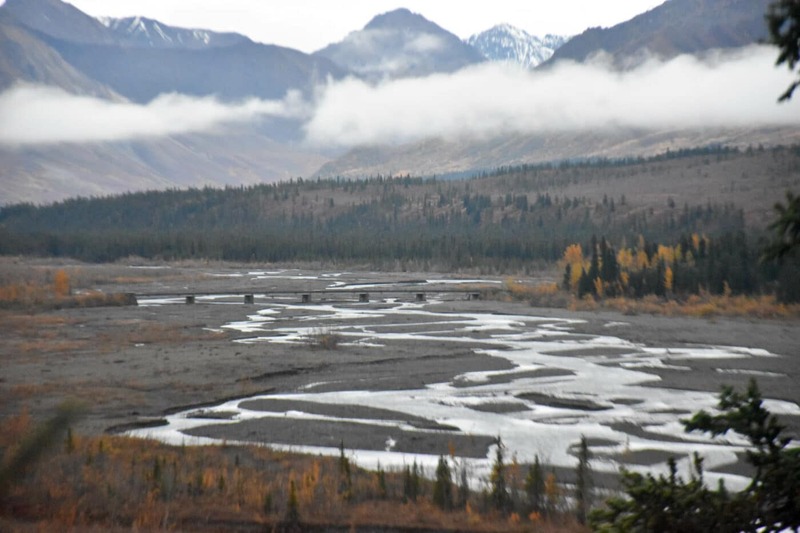 During the Denali Road Lottery, only 3 of the 6 campgrounds are open. Riley Creek Campground is located at Mile 0.5 right by the park entrance. Riley is a developed campground with water, camp store, and within driving distance of Glitter Gultch. There are 127 drive-in sites which can be reserved. There are 20 walk-in tent sites which are first come first serve. Savage River Campground is located at Mile 13. 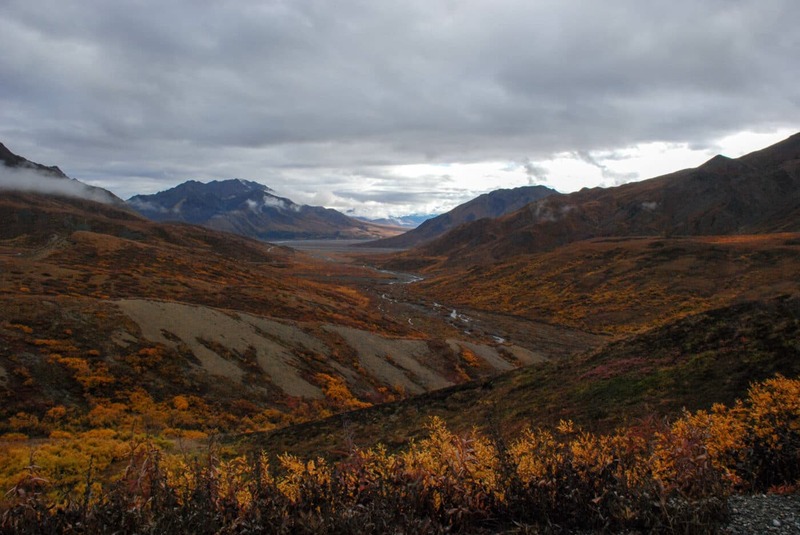 This campground is accessed by the paved section of the Denali Park Road. There are 32 sites in Savage. Reservations are highly recommended. Teklanika River Campground is located at Mile 29. During the road lottery, Teklanika is no longer limited to tent camping with access via the bus system. RV with a tow vehicle are allowed in the campground during this time. 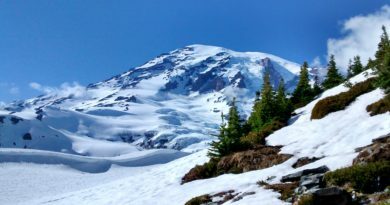 Reservations are available at www.reservedenali.com. The 92 mile Denali Park Road is a narrow dirt and gravel road. The road is well maintained by Park Service but it is still gravel and dirt. It doesn’t matter what the weather is. Your vehicle will be filthy after the road lottery. If the weather is dry, then your car will be covered in dust. If the weather is wet, then your car will be covered in mud. Be prepared for this. For the most part, 4 wheel drive isn’t required to drive this road. If it rains, the road can get slick and it might come in handy. My SUV never lost traction during my muddy day in the park. If you are driving a car with low ground clearance you will be fine until you get to Kantishna. There are two small streams you have to drive thru on the way to the end of the road. If the water level is high, do not cross the stream with a low clearance vehicle. 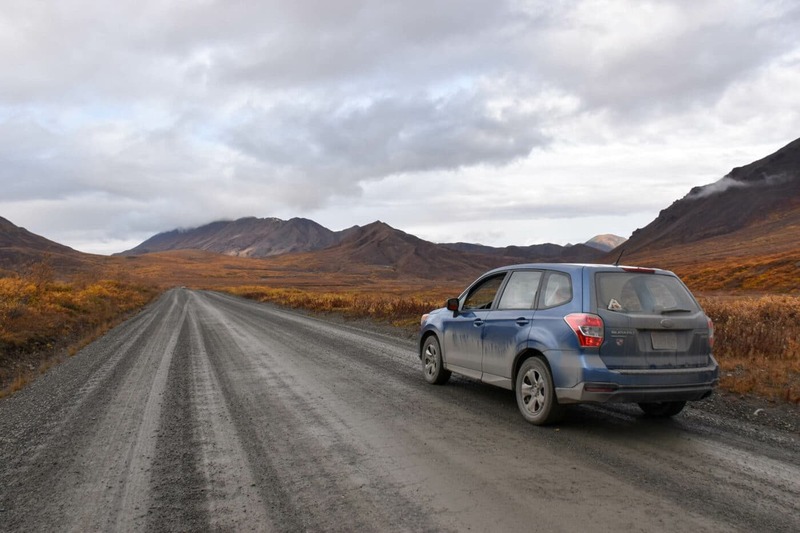 Please be aware that almost all rental car agencies in Alaska have a clause in their contracts that their rental cars will not be taken on gravel and dirt roads. 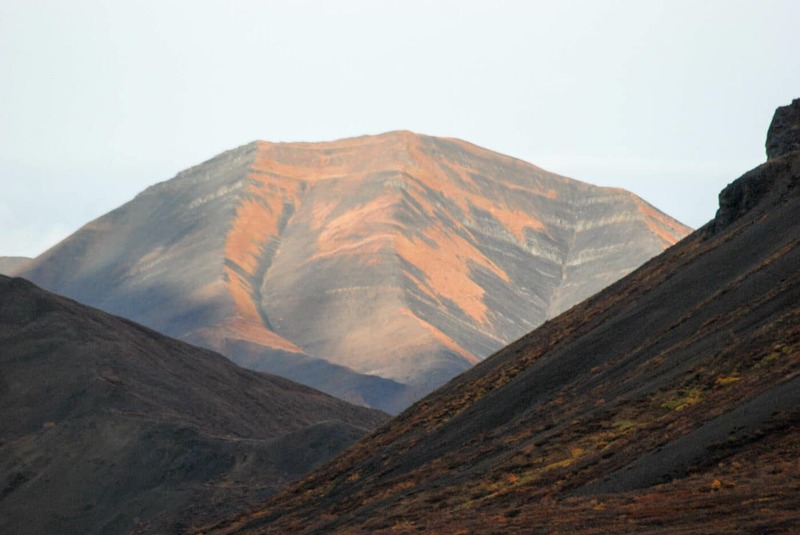 A few will specifically mention the Denali Park Road, Denali Highway and Dalton Highway. May rental cars do NOT come with a spare tire. There are no services on the road. You need to recognize that this road is 92 miles of dirt and gravel. It is rough on cars. It is possible that your car will be damaged during this trip. Flat tires are not uncommon. A chipped windshield is also common. Fuel tank of Gas – There is no fuel in the park. Tire Air Pressure – Check all 5 tires. The four currently on the ground and the spare tire. Trust me nothing is worse than a flat tire and discovering your spare is dead as well. I had this happen once. Binoculars – Most of the wildlife will be a ways off the road and impossible to spot without a pair of binocs. Spotting scope – If you are serious about getting a good look at the wildlife, consider getting a spotting scope with a cell phone camera mount to take pictures with. Don’t forget the tripod. Camera – Don’t forget your camera. On this trip, I got to play with my new 800 mm lens, but you don’t need a lens that big to take some amazing pictures. Use what you have in the way of camera or use it as justification to get that camera you have been drooling over. Rain Jacket – It is Alaska, having a rain jacket is necessary. You never know when the rainstorm will hit. Warm Hat – If the wind kicks up, it will feel like the temperature has dropped and a hat is the best way to stay warm. Food – Plan on eating breakfast, lunch, and dinner in the park plus snacks. I have a small cooler to keep lunch meat cold and a few sodas. Water – Bring enough water for the day. It is possible to get a refill in the park. One might expect Denali to be as abundant in wildlife. It isn’t. Denali isn’t Yellowstone where there is a buffalo every 100 feet. Life in the Tundra is hard and the food is much scarcer so the animals are larger and much more spread out. 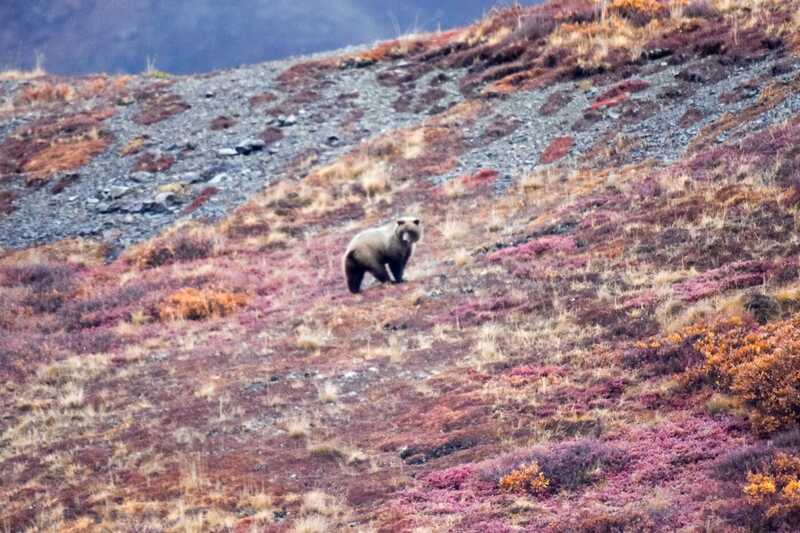 There are five main large mammals to see in Denali. There is no guarantee you will see any wildlife. 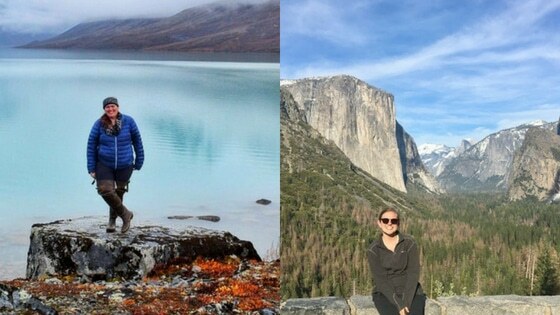 After spending a summer in a park here are the best areas to see wildlife. These are my recommendation for where I have commonly seen these animals, but you can see any animal anywhere in the park. Moose – Mile 8 – 13 – Look for the signs designating the area closed to hiking and photography off the road. I call this area my moose spot. 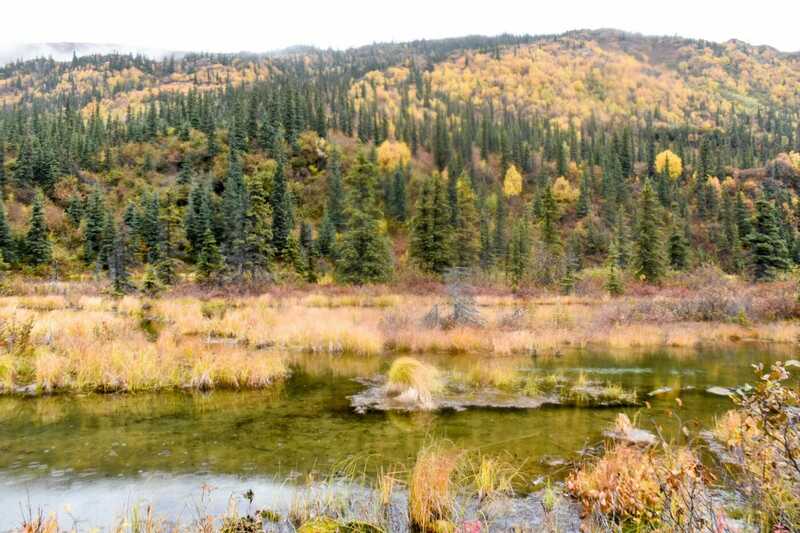 About 75% of my visit to Denali, I would see a moose in this area. 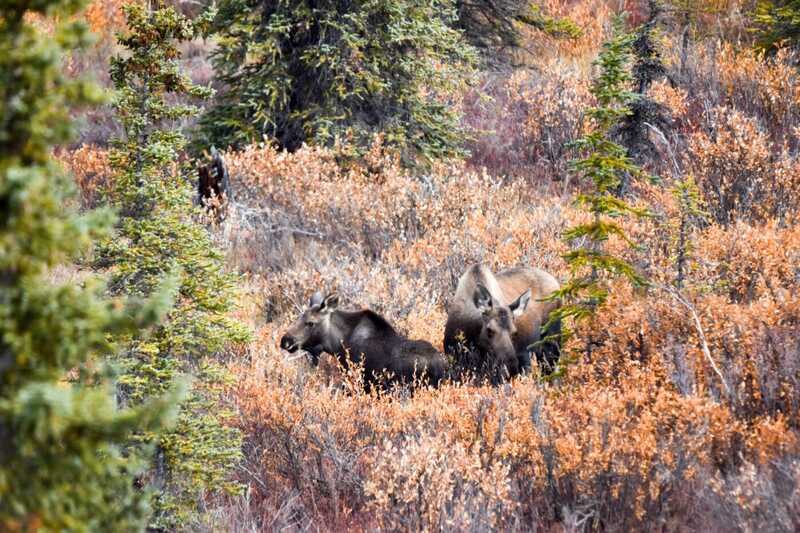 There are estimated to be 1,800 moose in the park. Grizzly Bear – Mile 37 – 43 (Sable Pass) and Mile 54 – 58 – Sable Pass is closed to hiking due to the high presence of grizzly bears in the area. Most of the bear sighting are in this area. I have had great luck around Mile 57 at seeing bears on the hillsides. Look for the brown bush that moves. 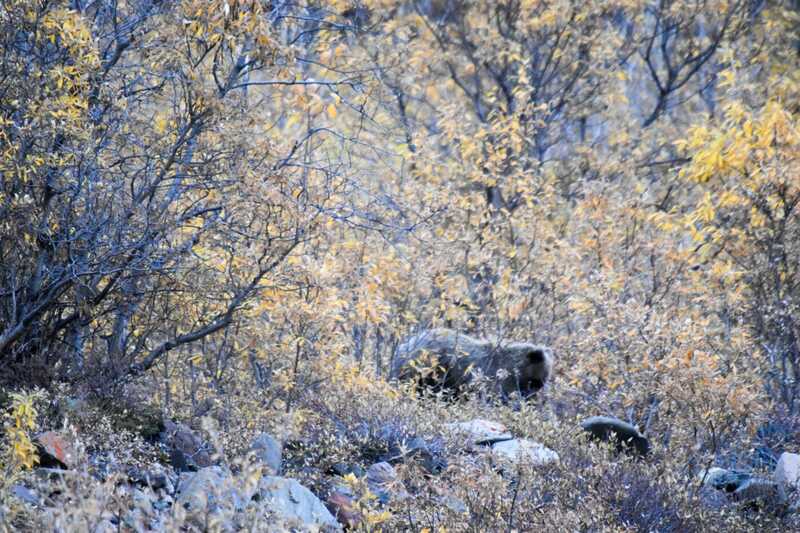 There are estimated to be between 300-350 grizzly bears in the park. Wolf – Go visit Yellowstone in May – Seriously, if you see one let me know. I have never seen a wolf in Denali National Park. Standing on side of the Parks Highway about 10 miles north of the park entrance I saw one ONCE. There are an estimated 82 wolves in the park. 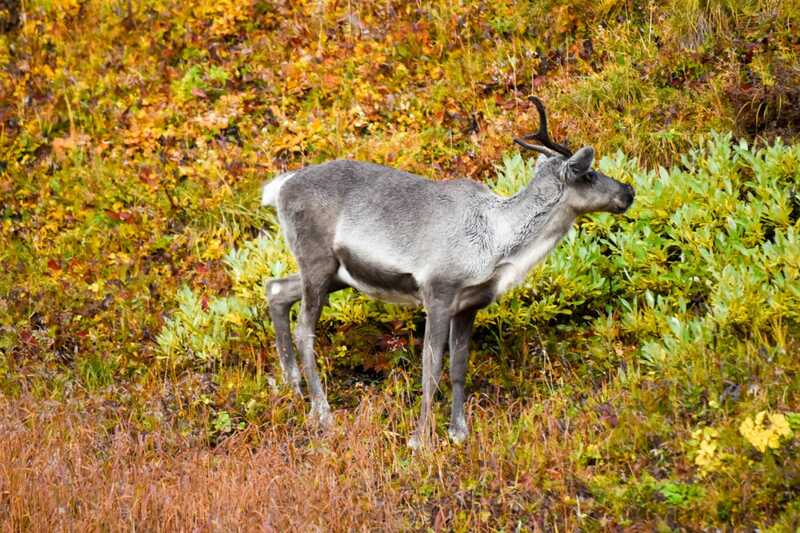 Caribou – Mile 14 – 16 and Mile 67 – 89 – Caribou can be found grazing in open areas. During the heat of the summer, it isn’t uncommon for them to be standing in water. Caribou are herd animals. They rarely go anywhere by themselves. They usually bring between 1 – 15 of their best friends everywhere they go. There are estimated to be 1,800 caribou in the park. 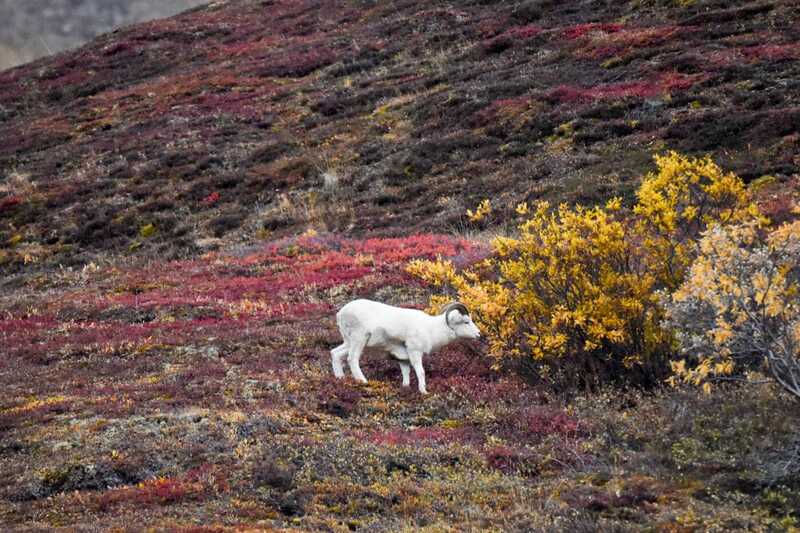 Dall Sheep – Mile 47 – 66 – Keep eye high on the mountainsides. Usually, about 2/3 of the way up on the mountain will be a bright white spot that stands out from the greys, yellows, and reds. Usually in groups of 2 – 12 individuals. 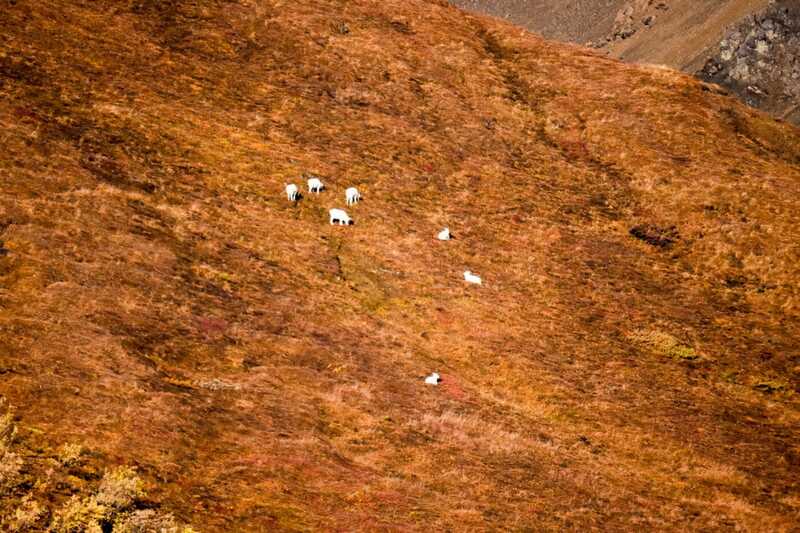 There are estimated to be 1,900 Dall sheep in the park. I highly recommend spending as much time as possible in the park. Start early and plan on staying late. Plan on having at least two people drive. It is a long drive and the drive needs to focus on driving. People not driving need to be scanning the hillside to see if they can spot the wildlife. My mom and I were turning on to the Denali Park road (Mile 0) at 5:15 am. I wanted to be at the Savage River Station (Mile 15) before it opens at 6:00 am. The drive to Savage River was pitch black. The sun doesn’t rise until 7:30 give or take in mid-September. We took it slow and made it to the Station with 10 mins to spare. There were 6 cars in front of us to get thru the checkpoint. The previous year, there were about 30 cars ready to go at 6:00 am. Park Service had 3 rangers at the station checking people in so check-in took a couple of minutes. With a quick reminder of the rules of the road, we were off into the park. Our lottery day was a little rainy and wet so it took about 45 mins to get to the Teklanika Rest Area but we made with time to spare. We even had a chance to stop and take a quick bathroom break and enjoy the views of the river. At 7:00 am on the dot, the gate opened and off we went to explore the park. By this point, there were maybe 20 cars waiting on the gate. We quite quickly spread out and it felt like we were in a world all our own. The clouds make for an interesting effect with the fall colors and mountains. It was amazing to see the ranges of yellows, reds, and greens in the national park. We didn’t see any wildlife until we hit the Toklat River. I saw a few white specks on the side of the mountain. It was pretty obvious they were Dall Sheep. We saw 7 sheep from the Toklat comfort station parking lot. While checking out the bookstore, I overheard the rangers on the radio. I headed out of the station and headed up to Mile 57. They had spotted a grizzly bear and the rangers were on traffic control. It turns out that it was actually 4 bears. A sow with her 1 old cubs and a young male across the river from them. We spent about 30 mins watching them until they disappeared from view. We kept heading into the park and stopped at the Polychrome Overlook. The Polychrome Mountains are an amazing range of colors. There are a couple of short trails overlooking the viewpoint. If Denali is out this will be your first chance to truely appreciate how big Denali is. We kept driving deeper into Denali National Park. 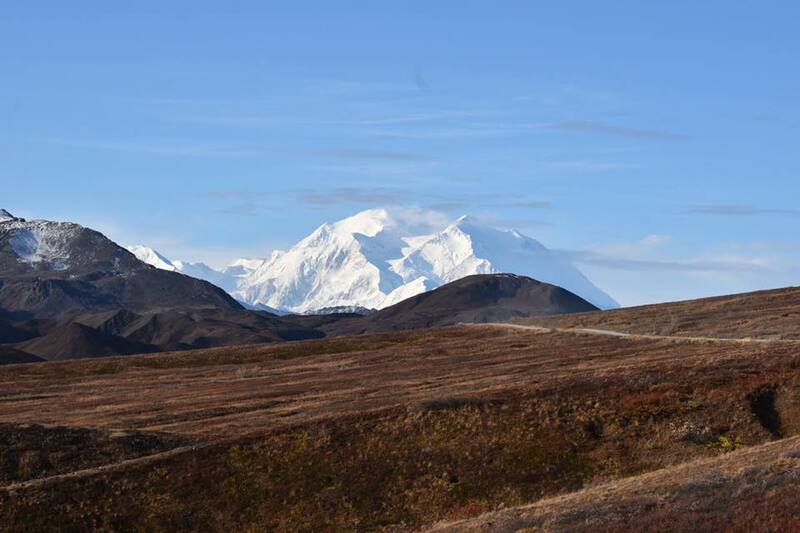 Normally, I would stop and enjoy the view at the Stony Hill Overlook but if Denali isn’t out the view isn’t quite as spectacular as it could be. Stop and be impressive should Denali put in an appearance. At Mile 66 is the Eielson Visitor Center. This eco-friendly visitor center offers real flush toilets. 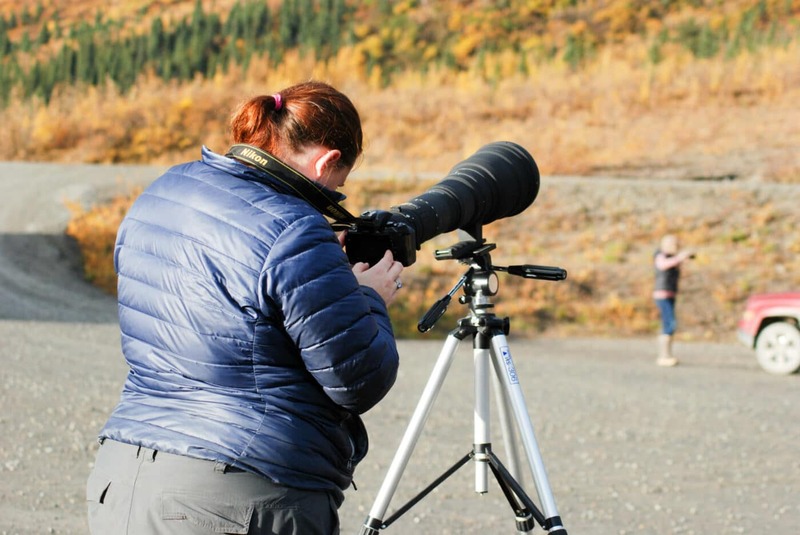 Another feature of Eielson is a record of the summer viewing of Denali. Each day at 9:00 am and 5:30 pm one of the rangers draws the current viewing condition. Some days it’s little more than white space others are a crystal clear mountain. There are several marked hiking trails. I would skip these trails on the way into the park. A couple of miles past the center, we saw two female caribou grazing by the side of the road. Around 1:30 pm, we arrived at Wonder Lake. I love eating lunch on the shores of Wonder Lake. There are several picnic tables. The only downside is that even in Septemeber there is a massive amount of bugs near the lake. After Wonder Lake, one arrives in Kantishna Minning District. 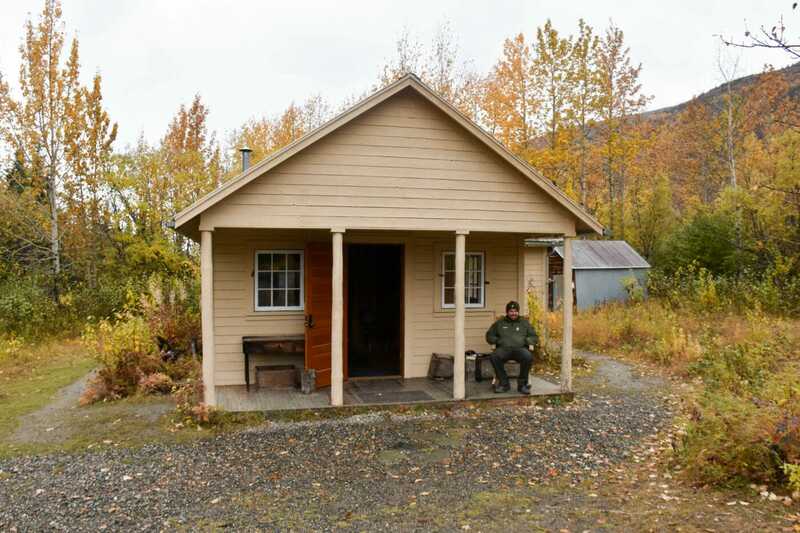 There is no longer any mining in the area but there are 4 privately run backcountry lodges. The lodges are closed for the season. There are two small creeks that need to be forged. Depending on the vehicle clearance these streams may be the end of the line. 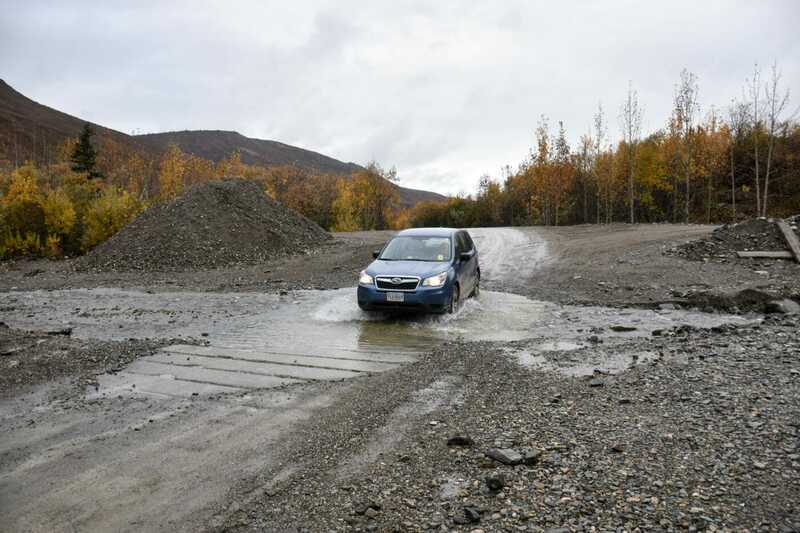 Check the water level before driving across if you bring a low clearance vehicle. Shortly before the end of the road, you will pass a cabin with a ranger standing around. This is Fannie Quigley’s Cabin. Fannie arrived in Kantishna as part of the 1905 gold rush. She planned to sell supplies to miners but alas the gold mining wasn’t hugely profitable so most the miners left. Frannie stayed anyway. She met her husband, Joe, and they built a life mining small amounts of gold and living off the land. They later divorced but Frannie stayed in Kantishna until her death in 1944. Her house is open and a ranger is there to answer any questions you have. Another half mile brings you to the end of the road. Enjoy this moment. We made the end of the road around 2:30 pm. We had plenty of time to take a power nap and grab a few pictures with the end of the road sign. With the end reached, it is time to head back to the park entrance. Only 92 miles to go. The great thing about the early start meant we had all the time in the world to work out way back out of the park. 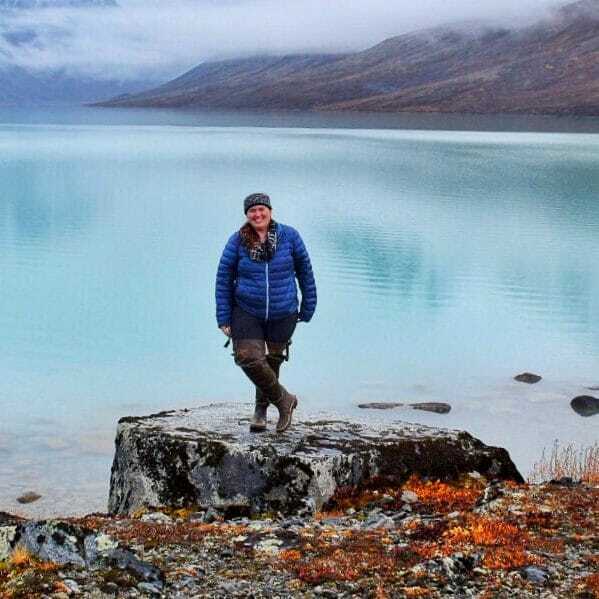 On the way back, we stopped at Eielson and take the Tundra Loop Trail and Spur. These two trails are 0.75-mile loops. They have a slight elevation change but nothing major. My mother has had two knee replacements and didn’t have an issue with the trail. There are two other maintained trails in the area as well. We took our time on the way out. We saw 3 grizzly bears, 5 Dall sheep, and 2 moose as we drove out of the park. We exited the park around 8:30 pm. I had planned for us to stay late and do some star and northern lights photography. Alas, the cloud cover never broke and there was no point in staying late in the park. 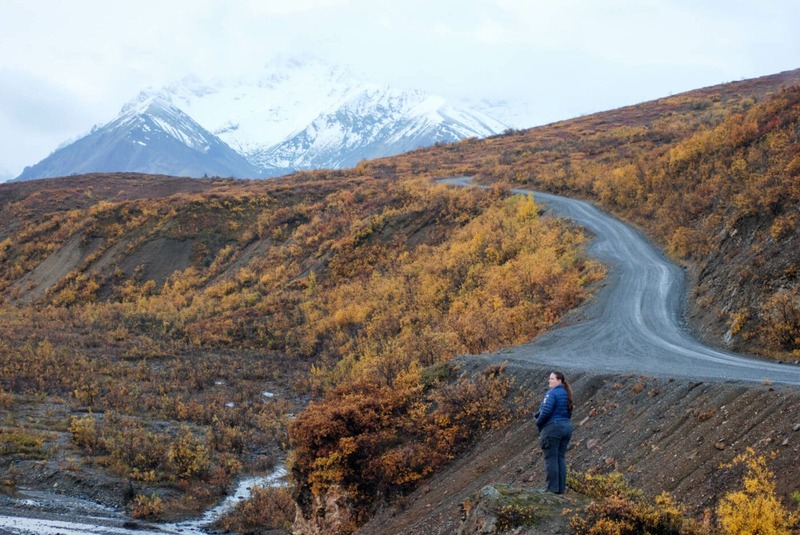 Are you ready to drive the Denali Road Lottery?